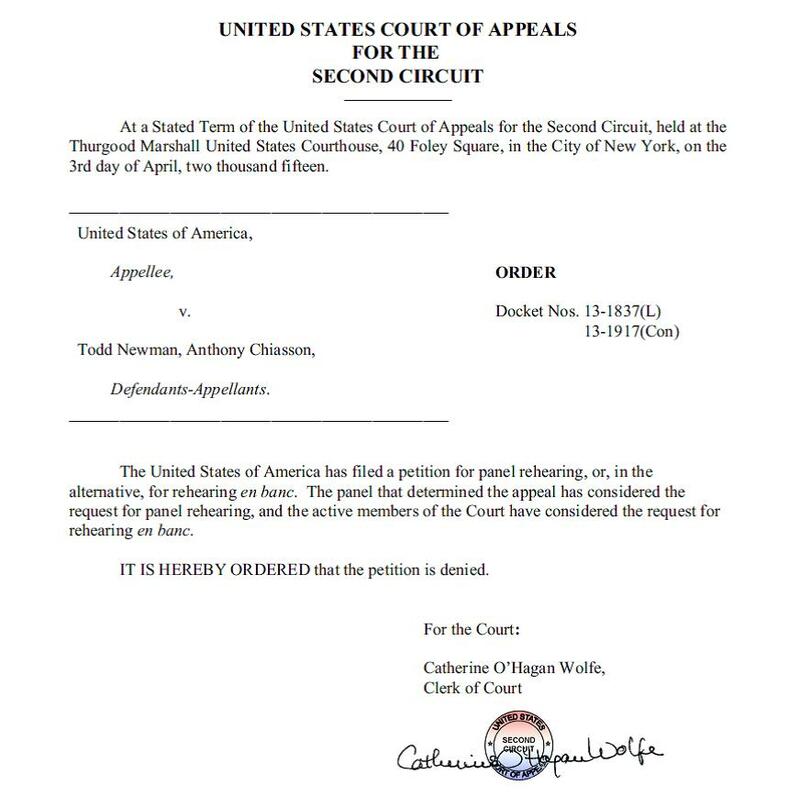 The Court of Appeals for the Second Circuit today denied the petition of the Department of Justice for reconsideration of the panel decision, or rehearing en banc, in United States v. Newman. This is as we had predicted. See DOJ Petition for En Banc Review in Newman Case Comes Up Short and SEC’s Amicus Brief in U.S. v. Newman Fails To Improve on DOJ’s Effort. Will the Supreme Court grant a petition for writ of certiorari? This entry was posted in Insider Trading, SEC Enforcement, Securities Law and tagged 2d Circuit, Anthony Chiasson, Chiasson, DOJ, insider trading, Newman, petition for rehearing en banc, SEC, SEC enforcement, Second Circuit, section 10(b), securities, Securities Exchange Act of 1934, securities fraud, securities law, securities litigation, Todd Newman, U.S. v. Chiasson, U.S. v. Newman, U.S. v. Newman and Chiasson on April 3, 2015 by Straight Arrow.